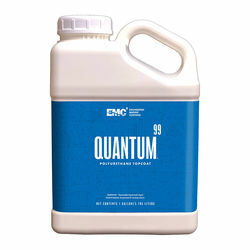 The core of the Quantum high solids repairable topcoat system, Quantum 99 is a revelation. DIYers & pros alike achieve professional results by brush, roller, or spray. Quantum 99 finishes have unmatched durability & gloss, plus superior stain & weather resistance. Unlike other topside systems, Quantum 99 finishes can be repaired by wet sanding & buffing. Twice the solids means a gallon goes twice as far, and just 2 coats create a finish depth (in mils) equal to 3 coats of other brands. Shorter cure times let you put your boat back in the water faster. Best of all, Quantum 99 finishes last 3 times longer than comparable paints, so you can spend spring weekends doing something other than buffing and waxing. Available in over 70 colors, including 6 metallic colors, in Quart and Gallon sizes. Base component must be paired with an activator (sold separately). Until now, 2 part topside paints were for professional use only. Complicated reducers, activators, and primers meant that 2 part polyurethane systems were mostly used by builders, yards, and professional paints. Quantum99 raises the bar for topside paint systems. Using a brush or roller, you can now achieve the same smooth, glossy finish that professionals get by spraying -with fewer coats and fewer products. Its innovative, hybrid formula gives you a lasting, high gloss finish with exceptional durability. Though this paint technology is new to the marine industry, it's not experimental. After nearly a decade of rigorous testing, Quantum99 has garnered rave reviews and proven results for superior gloss, gloss retention, and durability. Easy to use. Easy to repair. Its high solids, eco-friendly formula ensures fewer coats and VOC compliance. As an added benefit, if you need to refinish brightwork as well as topside surfaces, Quantum99 Polyurethane Topcoat paint and QuantumUV Clear Urethane Varnish use the same activators, reducers, accelerators, and additives (see the Quantum System Product Selection Guide at left for details). Note: Application of these product systems requires recommended temperature/humidity conditions and film thickness ranges. The material, hangar, and substrate temperature should be no lower than 45°F before, during, and after application. Do not apply paint materials to surfaces less than 5°F above the dew point, or to surfaces warmer than 125°F. Substrate temperature should be minimum 45°F to maximum 125°F. See the Quantum Reducer Chart for details. Quantum99 Polyurethane Topcoat is available in over 70 colors (see Color Chart). For custom colors, inquiries about additional colors not seen here, or to receive a Quantum 99 Color Card (sold separately; contains 60 of the most popular Quantum 99 colors, including 6 metallic colors), call us at (800) 497-0100. Important: We recommend spraying or using a professional for roll applications for the following Quantum99 colors: Sky Blue, Marlin Blue, Empress Blue, Moon Dust, Desert Tan, Desert Sand, and Castle Tan. Easy cleaning with marine soap and water. No buffing/waxing needed to restore gloss. Best results when spraying are obtained by applying two to three medium wet coats, allowing a 45- to 90-minute "tack-off" period between coats. Recommended dry film thickness is 2.0-3.0 mils (50-75 microns). Some colors (for example, reds and yellows) may require thicker films to achieve complete hiding. For brush/application, in most cases, tipping is not required. Application of these product systems requires recommended temperature/humidity conditions and film thickness ranges. Please refer to the Quantum99 Topcoat How To Guide (at left) for complete temperature, preparation, mixing and application details. Use Quantum Adhesion Promoting Surface Treatment (sold separately) before application to ensure strong adhesion of this coating. VOC Admixed: <420 G/L (3.5 LBS/GAL) - All colors. As per information provided on your page about Quantum 99 topside paint " You recommend using a professional for roll applications for the following Quantum99 colors: Sky Blue, Marlin Blue, Empress Blue, Moon Dust, Desert Tan, Desert Sand, and Castle Tan." Are all of that color required additional professional skill or that s mean all that color will give the best result? Thank you. This product is a complete scam. I fell for their literature and thoughtthat I could roll it myself. Carefully prep'd my 35' sailboat, did numeroustest panels, always used Quantum cigar rollers, thought I had it.Temperature 65 deg, low humidity. Had to sand down the whole boat. Did ita 2nd time, better, but far from a professional spray job, had to strip itdown again. Talked with yards, other users, EMC people, etc. finally foundout that only spraying Quantum will work. The brochure is a total lie.Did a 3rd painting after more test panels, the best yet but still completelyroller stippled from 10' or closer. It was now August, boat looked goodfrom 30' away so I launched.Stick with AwlGrip, never should have tried anything else. If anyone wantsto start a class action suit against EMC I'm all in. I used this productÂ (white color) and it turned out great on my nesting dingy. I used the roll and tip method which I have never done before.Â Turned out great and the paint is as hard as a woodpeckers beak!Â I dont think I would use a dark color with out more experience in the process. I would probably be disappointed in the outcome aesthetically.Â After 1.5 years on the dingy the paint is very tough and I would recommend it.Â make sure you properly prep between coats and dont take short cuts. I would say 1/4 of the cost of making a properly built boat is in the sandpaper you use! Â We rolled the Marlin Blue. I am a pretty experienced do it yourselfer. I was justÂ not happy with the texture. I sanded it down and reapplied twice and was still not happy. I have no skill with using a hvlp sprayer, so I opted to purchase the spray cans in the same color. The finish after 3 coats was wonderful. Looking back, I should have learned to use the hvlp sprayer because it would have been much cheaper that all those $80 paint cans, but regardless I am very happy with the final product. The medium gray that I rolled on was perfect after 2 coats of rolling. The darker colors really must be sprayed. Either buy the spray cans or do the research and practice the spraying. You must have a respirator when spraying regardless of what path you choose. We are extremely happy with the results a year later. Certain colors naturally hide imperfections to a degree, while the more bold colors tend to stick out a little bit more if they are not applied at a professional level. Does this come with both parts? 1 gallon of each? This product is just the base. All other components are sold separately. That way the customer can pick brush or spray activator, as well as any other additives. What can I use to clean my brush after using quantum top coat paint? Practiced on dinghy. Rolled, sanded, buffed, sprayed. Roll (used suggested rollers) gives orange peel but very good from far, could not buff section w/o obvious difference, sprays fantastic, can go over previous rolled areas (holidays) with wet roller but cannot touch with dry anything after only a few minutes, very, very durable. Really is good from far, if far from good. I wanted a paint that I can roll and tip to apply. I've tried one part, two part and water base. And so far this is the best overall for me to roll on. I don't even pull out a brush unless I need it because a roller won't fit. I mix it as recommended with their products. 2:1:1. Their white foam "cigar" rollers seem to last the longest also. Hoping EMC finds a distributer in the Seattle area!! I am in the middle of repainting the deck and cabintop of our steel 36' cutter off white. As it is the middle of summer, the heat and humidity are a real challenge, but it has been easy to use this paint nonetheless. We are using the recommended foam rollers, not spraying. The coverage, gloss and self leveling have been excellent. The off white is quite bright, though, and I would choose something more subdued if I had to do this again. It is difficult, especially in the white spectrum,to choose acurately from a color photo, and I was not successful in getting a color chip from the manufacturer. We are using a different product for the non-skid areas so I can't comment on that, but so far so good. I sprayed my boat. It came out awesome. It was a little more money than awlgrip but I actually saved because I got better coverage and didn't need to buy as much paint. I have following instructions and tried thinning,etc.. 30% resulting in drips, 15% results in orange peel. This paint is difficult to roll on without orange peel. This paint cannot be tipped with any success, too thick? I am not a professional painter, but this is not my first time using marine polyurethane either. The good part is after many hours of wet sanding and buffing out orange peel, the finish is very smooth and glossy. My advice is to have a professional spray this paint. I recommend this paint because it can be repaired due to amateur application. I've used this paint for over a year now in my boatyard. We've painted a number of boats and parts with great success. It goes on easily and shines like no other paint we've used. When you do make a mistake, it's easy to fix and you can't even tell where the repair was.We've also had really good results clear coating wood. I restored a 1987 31 Rampage Express last year. It was in severe need of a new paint job. There was a dark blue boat in the boat yard that had the EMC finish on it for five years and sat in the sun the whole time. It looked like it was just sprayed. That was all the convincing I needed. No waxing or buffing..GREAT!!. We rolled the primer on, sanded and prepped everything for the top coat. Had the topcoat sprayed and it looks Fantastic!! And not to mention relatively inexpensive since we did most of the work ourselves. Its been a year and many hours of usage later. It still looks new...other than the wahoo teeth marks on the back. My 1987 express looks like a new boat!